Want to prepare for Lollapalooza with some free live music from two of this year's buzz bands? Then head over to the Apple Store at 679 North Michigan Avenue on Thursday, August 6 for a no-charge Lolla warm-up show featuring Passion Pit and Chairlift. 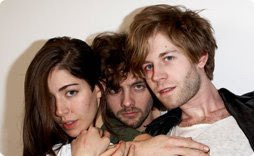 Chairlift will play at 6 p.m. and Passion Pit will follow at 7 p.m. Both bands are scheduled to perform at the festival that weekend, with Chairlift slated for Saturday at 3:30 p.m. and Passion Pit for Sunday at 5 p.m. If you'll be otherwise occupied during their sets in Grant Park, the Apple Store gig is the perfect opportunity to check them out. Brooklyn's Chairlift have attracted widespread attention with their dreamy synth-pop, propelled by the impressive vocals of front woman Caroline Polachek. It hasn't hurt that their song "Bruises" has been featured in ads for Apple's iPod Nano. Boston-based Passion Pit kicked off after the unlikely success of an EP, Chunk of Change, which was recorded as a Valentine's Day gift for singer-songwriter Michael Angelakos's girlfriend. Since then, the band have kept the momentum going by bringing their electro-indie pop sound to a full LP, Manners. Click here for more information on the Apple Store gig.